Create an attractive and functional outdoor living area that will enhance your home and lifestyle with the smooth, simple, uncluttered lines of the classic Outback Flat Roof Verandah, Patio or Carport. Our team has years of experience in outdoor entertainment solutions, with a range of designs available to suit the style of any home. When you’re looking to give your home a great new outdoor space, insist on the genuine quality of the Stratco Outback verandah, patio and carport systems and enjoy the fresh air, outback style. Contact us today on (03) 9728 5377 and we will be happy to work with you on delivering the best solution for your space. Each feature is carefully engineered to serve the function of our verandahs and carports without harming its appearance. Fastenings and brackets are coloured or concealed to keep the signature aesthetic of the design, and all necessary gutters and downpipes are included in the installation. With a variety of colours to select from, you’ll easily find a style that will achieve the look you need. You can also choose whether to construct a freestanding unit or attach it to the house. 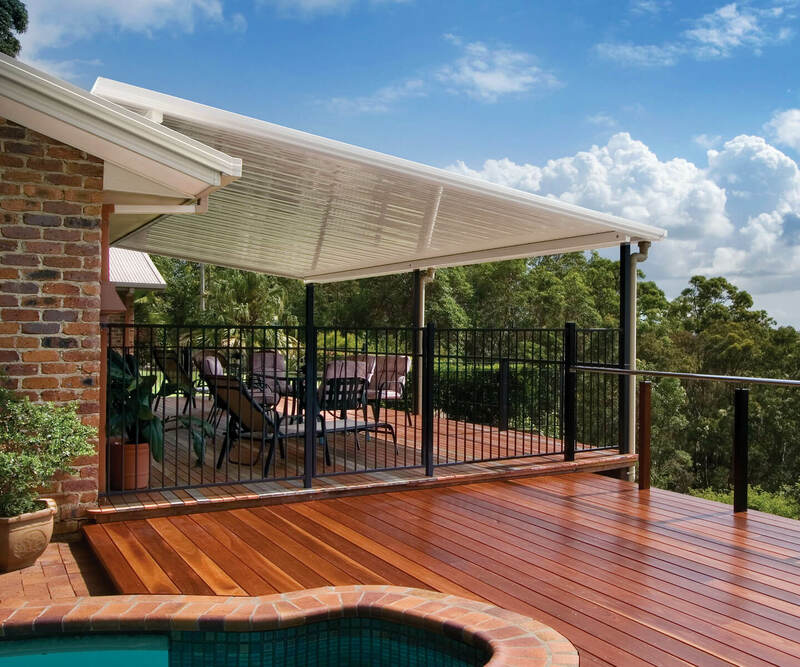 Stratco Outback verandahs, carports and patios use only the best quality materials, and undergo strict testing by independent experts to ensure they meet all relevant requirements. The designs have earned a reputation for innovation and durability through years of successful projects. Create a functional outdoor living area that will enhance your home and lifestyle with the smooth, simple, uncluttered lines of the classic Outback Flat Roof. The versatile Outback Flat Roof system can be configured to cover any area around the home. It is ideal as a single unit or incorporated with a gable roof, curved roof, or pergola system. Available as either a freestanding structure or attached to the home it can be used as a verandah, patio or carport. With the addition of the Outback Rooflite™ you can supply ltered light to the underside. The beams can span up to 8.4 metres and are available in either 120mm or 150mm sizes. A 4.5 metre maximum span and only requires an outside beam to support the structure, although most units use perimeter beams on all sides to provide the best appearance. The same as Type One, but with an overhang at the front to increase the covered area to 5.4 metres. Support beams span across the roof sheets, allowing to run horizontally for a different appearance. Extra support beams and a purlin through the middle to give it a span of 8.4 metres. In addition to the high standards of construction, you’ll get peace of mind with a 15 year guarantee on structural quality. As we are properly authorised to install Stratco steel verandahs in Melbourne, you’ll also get an installation guarantee for a full year once we’ve completed the project to ensure it’s built to last. Only products manufactured by Stratco have all of these features. Enjoy outdoor living with the genuine Stratco Outback range which pairs innovative design with the support of this national manufacturer. Get a Stratco verandah installed by the fully registered team at Outdoor Impressions and see the value we add to your home. Call today on (03) 9728 5377 or complete our contact form for the finest outdoor solutions in Melbourne. * Applies to non-cyclonic designs only. † Height limited to 2400mm.